Birds, as you may or may not already be aware, love to party, and by "party" I of course mean eat fermented rowan berries until they die from alcohol poisoning. 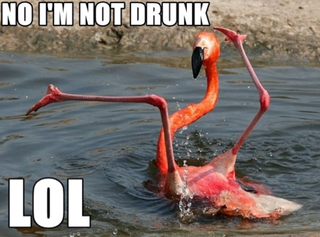 According to a Saturday report in the British Medical Journal's Veterinary Record, drunk birds react pretty much exactly as drunk people, if people had wings and thus the added danger of trying to fly in between buildings while intoxicated. You might, at this point in your Sunday news perusal, be wondering why this is at all newsworthy and maybe also thinking that we shouldn't make fun of bird for enjoying the occasional cocktail after a long day of preening and harmonizing. I'm glad you're such a critical-minded reader. Researchers determined that birds can get drunk on fermented berries after investigating the mysterious, mid-air deaths of 14 blackbirds that apparently just flew into each other. Wild theories abounded as to how this could have happened. Were we witnessing an outbreak of avian flu? Were the birds trying to kill themselves before the Rapture? Nope! Bird coroners detected a fermenting smell coming from the dead birds and discovered, much to their chagrin that each bird had rowan berries in their stomachs. Further testing showed that at least one bird had pure, unadulterated booze in its system.